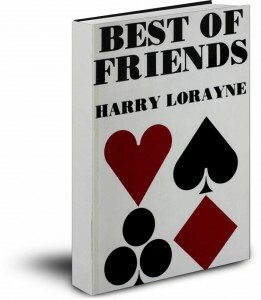 LIMITED TIME: 50% off Best of Friends, Volume 1 by Harry Lorayne! Harry Lorayne’s Best of Friends series is one of your best opportunities to find and explore the work of a number of magic’s great creators. He includes a short biography and several effects for each contributor. You will get to know a number of your favorite magicians a little more intimately, while also discovering many new ones! Best of Friends is a great resource for learning magic from dozens of master magicians. There are sections that describe the magic of Larry Jennings, Bro. John Hamman, Ken Krenzel, Sid R. Spocane II, Herb Zarrow, and more! Jim Swain’s “Vanishing Aces” is an exceptionally visual ace trick, and Jack Birnman’s “False Identity” will satisfy even the most well read card men. We are the exclusive retailer for all of Harry Lorayne’s digital titles, please check out the whole collection!